Kiwi ace this week snapped a win-less streak that lasted 22 months. Michael Donaldson analyses her arduous journey back to the champion's circle. You've seen pictures of Lydia Ko. You've seen her slightly crooked incisor — a snaggletooth if you like. Perfectionists, fans of symmetry and orthodontists might suggest fixing it but it's part of who Lydia Ko is. And when she laughs, as she did so often as a youngster, you might notice it but it doesn't change the joy she radiates when she's happy. That crooked tooth is a metaphor for the much-admired swing Ko employed to great effect in her amateur years as she chewed her way through golf's record books. Sadly, however, her smile has been largely missed for two years as Ko battled to untangle three years of tuition under controversial coach David Leadbetter — not to mention putting up with sideline sniping from her former coach who developed a penchant for blaming Ko's parents for her fall from the No 1 ranking she occupied for 84 weeks in 2015-16. There have been many theories behind Ko's demise — notably the chopping and changing of coaches and caddies — but the root of her problem was a bold decision to unlearn everything she'd been taught by Leadbetter and his team. Any golfer knows how difficult it is to groove a swing — how hard it is to get out of your own way, to empty your mind, to trust the movement you're about to execute. What all great golfers have in common — no matter how they swing the club — is an ability to get the club face back to the right position at impact; to square the face, as they say. The repeatability of the swing, rather than how it looks, is critical. As an amateur, Ko, according to former coach Guy Wilson, had "the ability to square the club face up like no one. It's pretty freaky, and really, really early, you could see it." Technically, however, Ko's mechanics were not perfect; she had what purists would consider a flaw. Her club face at the top of the back-swing was "closed" and as a result, she had to unwind her hips incredibly fast to get the club face back to that square position. New Zealand great Sir Bob Charles was not a fan; he once told a New Zealand Golf AGM that Ko's swing wouldn't cause him to pause and watch if he passed her on the driving range. Yet he acknowledged there was another facet he couldn't ignore — an intangible that brought out some rich descriptions from others, such as "mystical" and "flawless". He couldn't ignore the way she swung the club. The amateur Ko brought the moving parts together with a seamless rhythm and a metronomic tempo. She never jerked, over-extended, got out of balance or hurled herself at the ball. The club flowed around her body with an unhurried grace, her impeccable tempo never changing, no matter what club she used nor the pressure of the situation. Fellow amateur team-mate Emily Perry once described Ko's swing as "robotic but beautifully robotic — there's no other words for it". When Ko turned pro, her mother Tina told new coach Leadbetter she'd like to remedy the closed face flaw. Her dad Gil Hong was said to be a fan of Korean Hee Young Park, who has won just twice on the LPGA tour despite her admired mechanics. Staying with the dental analogy, Leadbetter's theory wasn't to fix the crooked incisor, but to take out all the teeth and replace them with dentures — the swing he got Ko to implement was a visually unpleasant lift-hitch-swoop thing that had some resemblance to the way Jim Furyk swings — an action once described as being like an "octopus falling out of a tree". The remarkable thing about Lydia Ko is that she is so talented and such a great learner, she was able to win plenty of tournaments while transitioning to Leadbetter's A (for Alternate) Swing. But instead of swinging with a slightly flawed purity, her swing became effective but jangly — it wasn't Lydia Ko's swing. She didn't own it, she rented it. She won despite the changes not because of them. The other thing, and I confess to reading between the lines here, is that the Leadbetter Academy put a lot of focus on strength and conditioning in order to build Ko's power. They wanted her to hit it further, so in the years Ko was under Leadbetter's tutelage, she worked hard to build her leg and core strength. Ko is not what you'd call a gifted athlete — and bulking up didn't suit her at all. 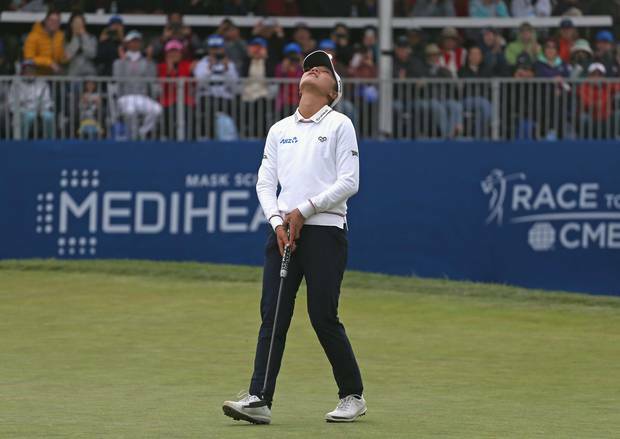 Lydia Ko of New Zealand reacts after making an eagle to win the Mediheal Championship at Lake Merced Golf Club on April 29, 2018 in Daly City, California. Photo / Getty Images. So from the age of 16 to 19 — remind yourself for a minute what it's like to be this age — Ko not only reworked her swing but she changed her body shape. The fact she's now a slender, trimmer 8kg-lighter version of the player who left the Leadbetter camp in late 2016 says much about how useful she found that gym work. When Ko quit his academy, Leadbetter attacked her parents for interfering too much — neglecting the fact that the only reason Ko ended up under his tutelage in the first place was because of her parents. He also showed little understanding of the Korean family culture, one where parents are firmly in control and children fulfil their duty. There is more parental influence in a Korean family than most Western ones. And everyone who knows the Ko family acknowledges her parents, even though they want the best for their daughter, are not the pushy interfering type. The week before the win, Leadbetter was at it again, posting a blog on his website attacking Ko's parents, specifically her father — "an unaccomplished golfer" — for meddling with her swing. The truth is that her parents have always wanted what is best for their daughter. They thought Leadbetter was the answer. He wasn't. They made a mistake, they've fixed it. They realised everything happening under Leadbetter was slowly moving Ko away from the essence that had made her great to start with — a carefree swing that matched her carefree, bubbly personality. In searching for perfection and power, she lost rhythm, tempo, grace and repeatability. I wrote at the time of her split that Ko needed to "detox" from the Leadbetter experience. She did that in 2017, working with Gary Gilchrist. That was a rebound relationship to some extent. It's too early to say that new coach Ted Oh and new caddie Jonny Scott have made a difference to Ko, but in San Francisco, she played with a freedom and lightness that had been missing for the previous two years. What we saw was the old Ko — or rather the young Ko rebooted. Her swing wasn't exactly the same as the one from her amateur days but it was fluid and graceful and she executed it without looking like she had to remember every piece of code in the software. And she started laughing again, which had always been an on-course trademark. For now, the famous smile — snaggletooth and all — is back.